Introduction : Thorough disinfection of the root canal system is essential for the success of root canal therapy. Enterococcus faecalis is the most frequently found species in persistent/secondary intracanal infection associated endodontic treatment failure. The aim of this study was to evaluate the disinfection of dentinal tubules using 10% Chlorpromazine, 4% Lignocaine gel, 5% Amiloride hydrochloride in comparison with 2% chlorhexidine gel. Materials and Methods : The antibacterial efficacy of the four medicaments against Enterococcus faecalis was assessed in vitro using extracted human first and second mandibular premolar teeth at the depths of 200 ΅m and 400 ΅m. Results : The overall percentage inhibition of bacterial growth was 100% with 2% chlorhexidine gel followed by 10% chlorpromazine (88.8%), 4% lignocaine gel (76.4%) and 5% amiloride hydrochloride (71.4%). Conclusion : 2% chlorhexidine gel was most effective against E. faecalis followed by the newer non- antibiotic medicament 10% chlorpromazine when compared to the other medicaments tested. Calcium hydroxide is the most widely used intracanal medicament, requiring a disinfection period of seven days. The high pH of calcium hydroxide formulations', alters the biologic properties of bacterial lipopolysaccharides in the cell walls of gram-negative species and inactivates membrane transport mechanisms, resulting in bacterial cell toxicity. However, certain strains of E. faecalis has been reported to be resistant to this effect as a result of its ability to penetrate the dentinal tubules and to maintain pH by proton pump activity. The search for a better alternative has lead to the introduction of antimicrobial agents like chlorhexidine (CHX) and newer non-antibiotics like chlorpromazine, lignocaine and amiloride hydrochloride. Hence, this study was undertaken to evaluate the disinfection of dentinal tubules contaminated with E. faecalis by using lignocaine gel (4%), amiloride HCl (5%) and chlorpromazine (10%) in comparison with 2% Chlorhexidine gel. The model proposed by Haapasalo and Orstavik  was modified for this study, 50 freshly extracted single rooted first and second mandibular premolar teeth were selected. E. faecalis was used as the test organism in this study. This gram ­positive facultative anaerobic bacterium is the most common isolate found in endodontically failed cases. Isolated 24-hour colonies of pure culture of E. faecalis (ATCC 29212) grown on tryptone soy agar were suspended in 5 mL of TS broth and incubated for 4 hours at 37 o C . The culture suspen­sion was adjusted to match the turbidity equivalent to 0.5 McFarland standard. Fifty micro liters of the inoculum was transferred to presteril­ized individual microcentrifuge tubes containing 1 mL of the TS broth and dentin block. The dentin blocks were transferred to fresh broth containing E.faecalis every second day. All the procedures were carried out under laminar flow (Clean Air, Mumbai, India). The purity of the culture was checked by sub culturing 5 ml of broth from the incubated dentin block in TS broth on tryptone soy agar plates (HiMedia). The dentin blocks were contaminated during a period of 21 days. Five blocks were picked randomly and assessed for the depth of penetration of E. faecalis by using light microscopy. After the incubation period, the blocks were irrigated with 5mL of sterile saline to remove the incubation broth. The dentin blocks (n= 50) were as­signed to the following groups, with 10 blocks in each group: group 1, saline (negative control); group 2, 2% chlorhexidine gel (positive control)(Kem Colour International, India); group 3, 4% lignocaine gel (Warren Laboratories, Abbott); group 4, 5% amiloride hydrochloride (Glaxo Smithkline, India); and group 5, 10% chlorpromazine (Sun Pharmaceutical Industries Limited, India).According to Fava and Saunders  the antibacterial activity of intracanal medicaments is enhanced by the vehicle used. Hence, appro­priate vehicles were chosen for the individual-medicament as described below. Group l received no medicament. Polyethylene glycol was used as a vehicle in group 2 and 3. Methyl cellulose was used as a thickening agent in both groups. In groups 4 and 5, the powder was mixed with dimethyl sulfoxide (DMS) solution in ratio 1.5:1 (wt/vol.) to obtain a paste like consis­tency. This paste was placed in the canal with a plastic instrument and condensed with a hand plugger. The orifice of all the blocks after medica­tion were sealed with paraffin wax and incubated in an anaerobic environment at 37 0 C.
Antibacterial assessment was performed at the end of 1, 3, 5 days with 10 blocks from each group. The blocks were washed with 5mL of sterile saline combined with ultrasonics to remove the medicament. Dentin debris was harvested at the depths of 200μm and 400μm by using Gates Glidden drills nos. 4 and 5 (Mani Inc) and collected in 1 mL of sterile TS broth and incubated in an anaerobic environment at 37°C for 24 hours. After the incubation period, the content of each micro centrifuge tube was serially diluted, 100 μL of broth in 100 μL of normal saline for 5 times. Five microliters of this diluted sample was plated on TS agar plates and incubated for 24 hours. Colonies were counted, and readings were tabulated. The current study showed that all four medicaments studied exerted antibacterial activity. The light microscopy evaluation of five dentin blocks showed invasion of the bacteria within the dentinal tubules. Infection of dentin blocks was confirmed when debris samples harvested from the saline group (negative control) yielded positive growth. [Table 1] showed the antibacterial activity, which was measured at the depths of 200 μm and 400μm. The inhibition of growth in all the groups was statistically significant in comparison with control group (saline). Group 2 (2% chlorhexidine gel) was most effective against E.faecalis. Intergroup comparison showed that inhibition in group 5 (10% chlorpromazine) was statistically significant compared with group 3 (4% lignocaine gel) and group 4 (5% amiloride hydrochloride). No statistical difference was seen between group 3 (4% lignocaine gel) and group 4(5% amiloride hydrochloride). There was no statistical difference in the data between 200μm and 400μm. 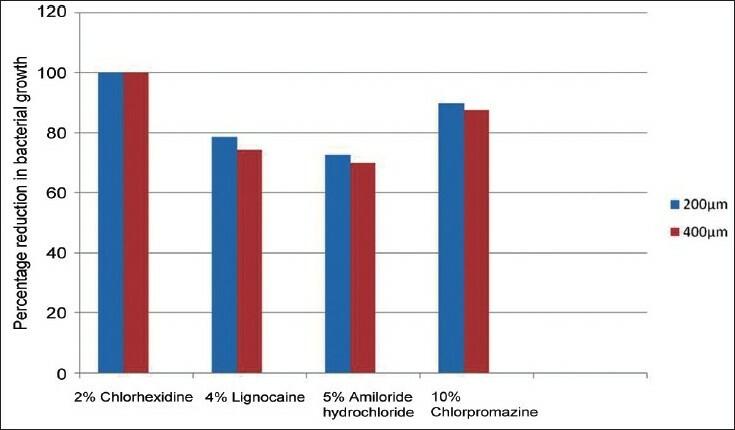 To summarize the results, maximum inhibition was produced with 2% chlorhexidine gel (100%), followed by 88.8% inhibition with 10% chlorpromazine, 76.4% and 71.4% inhibition with respect to lignocaine gel and amiloride hydrochloride. [Figure 1]. Chlorhexidine (CHX) has a wide antibacterial spectrum and is effective against gram positive and gram negative bacteria as well as yeasts and candida species. In the present study 2% CHX gel provided 100% inhibition of E.faecalis at depths of 200μm and 400μm from day 1 to day 5. Lignocaine which is a local anesthetic showed 78.6% and 74.2% inhibition of E.faecalis at depths of 200 μm and 400μm. The effect of lignocaine might be attributed to the presence of antibacterial agent sodium metabisulfite. The gel form was chosen because the viscosity of the gel keeps the active agent in contact with the root canal walls and dentinal tubules. Within the limitations of the present study, 2% chlorhexidine was most effective against E. faecalis followed by the newer non- antibiotic medicament 10% chlorpromazine. 1. Athanassiadias B, Abbott PV, Walsh LJ. The use of calcium hydroxide, antibiotics and biocides as antimicrobial medicaments in endodontics. Aus Dent J 2007;52 (1 Suppl):S64-82. 2. Krithikadatta J, Indira R, Dorothykalyani AL. Disinfection of dentinal tubules with 2% chlorhexidine, 2% metronidazole, bioactive glass when compared with calcium hydroxide as intracanal medicaments. J Endod 2007;33:1473-6. 3. Stuart CH, Schwartz SA, Beeson TJ, Owatz CB. Enterococcus faecalis: Its role in root canal treatment failure and current concepts in retreatment. J Endod 2006;32:93-8. 4. Portenier I, Waltimo T, Orstavik D, Haapasalo M. The susceptibility of starved stationary phase, and growing cells of Enterococcus faecalis to endodontic medicaments. J Endod 2005;31:380-6. 5. Hubble TS, Hatton JF, Nallapareddy SR, Murray BE, Gillespie MJ. Influence of Enteroccocus faecalis proteases and the collagen-binding protein, Ace, on adhesion to dentin. Oral Microbiol Immunol 2003;18:121-6. 6. Chong BS, Pittford TR. The role of intracanal medication in root canal treatment. Int Endod J 1992;25:97-106. 7. Sjogren U, Figdor D, Spangberg L, Sunquist G. The antimicrobial effect of calcium hydroxide as a short-term intracranial dressing. Int Endod J 1991;24:119-25. 8. Siqueira JF Jr, Lopes HP. Mechanisms of antimicrobial activity of calcium hydroxide: Critical review. Int Endod J 1999;32:361-9. 9. Kristiansen JE, Amaral L. The potential management of resistant infections with non-antibiotics. J Antimic Chem 1997;40:319-27. 10. Haapasalo M, Orstavik D. In vitro infection and disinfection of dentinal tubules. J Dent Res 1987;66:1375-9. 11. Zehnder M, Soderling E, Salonen J, Waltimo T. Preliminary evaluation of bioactive glass S53P4 as an endodontic medication in vitro. J Endod 2004;30:220-4. 12. Fava LR, Saunders WP. Calcium hydroxide pastes: Classification and clinical indications. Int Endod J 1999;32:257-82. 13. Basrani B, Santos JM, Tjäderhane L, Grad H, Gorduysus O, Huang J, et al. Substantive antimicrobial activity in chlorhexidine-treated human root dentine. Oral Surg Oral Med Oral Pathol Radiol Endod 2002;94:240-5. 14. Haapasalo M, Endal U, Zandi H. Eradication of endodontic infection by instrumentation and irrigating solutions. Endod Topics 2005;10:77-102. 15. Weber CD, McClanahan SB, Miller GA, Diener-West M, Johnson JD. The effect of passive ultrasonic activation of 2% chlorhexidine or 5.25% sodium hypochlorite irrigant on residual antimicrobial activity in root canals. J Endod 2003;29:562-4. 17. Amaral L, Lorian, V. Effects of chlorpromazine on the cell envelope proteins of Escherichia coli. Antimicrob Agents Chemother 1991;35:1923-4. 18. Amaral L, Kristiansen J, Lorian V. Synergic effect of chlorpromazine on the activity of some antibiotics. J Antimicrob Chemother 1992;30:556-8. 19. Kramer A, Sorgatz K., Höppe H, Meyer FU. Bacteriostatic and antiseptic efficacy of selected anaesthetics individually and in combination with an antiseptic mouthwash. Hygiene Medizin 1994;19:527-34. 20. Giunta S, Galeazzi L, Turchetti G, Sampaoli G, Groppa G. In vitro antistreptococcal activity of the potassium sparing diuretics amiloride and triamterene. Antimicrob Agents Chemother 1985;28:419-20. 21. Haapasalo M, Qian W, Portenier I, Waltimo T. Effects of dentin on the antimicrobial properties of endodontic medicaments. J Endod 2007;33:917-25.